Danger Mouse: The Danger Games is a hybrid card-collecting game and character racing game in the spirit of “Mario Kart.” Set in a fictional reality show, TDG starts players with a narrow range of character cards from the “Danger Mouse” television series and has them use tap-swipe controls to race through themed arenas featuring different hazards, obstacles, and mini-games. Racers gain experience and rewards for each race, and rewards consist of currency as well as card packs containing upgradeable character and power up cards. Heroes can equip up to three power ups and/or weapons (cricket bats, milk bombs) that can be used strategically to give players an edge in the race. Players can send cards to one another for currency, unlock additional arenas as they progress, and trade earned currency for card packs. This little racing game proves it’s possible to create a good-quality, truly free-to-play app. Danger Mouse: The Danger Games’ friendly approach removes all the negative aspects of online multiplayer while preserving everything fun about competitive racing. Its first good move is making players choose from pre-existing (though randomly generated) names. That means your kids’ identities aren’t at risk, and they won’t be exposed to crude or obscene player names. 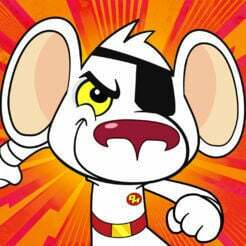 The next good choice Danger Mouse: TDG makes is its lack of chat. The only communication occurs through four basic emojis (sad, happy, angry, or bored) at the start and end of each race, so there’s no chance for trash talk or bullying. Even better than the social aspect though is the gameplay. Each hero (or heroine) has his (or her) own strengths, and these can be augmented with wonderfully silly power up cards like Bubble Wrap or Unicorn Fart. Arenas are colorful, creative, and sprinkled with funny hazards like robots and teddy bears which savvy players will put to strategic use. Best of all, no matter how you place — first place or fourth — you win card packs and currency to expand your collection. Granted, every few minutes there are some annoying ads to sit through, and the app does remind you to visit the shop and buy things. Still, progress is totally possible without spending a dime, and what’s a few 30-second interruptions in exchange for this much free fun?